WASHINGTON-- Legendary Texas radio personality Ron Chapman will be inducted into the NAB Broadcasting Hall of Fame during the NAB Show Radio Luncheon, sponsored by ASCAP. The luncheon, held Tuesday, April 13, will also feature the annual presentation of the prestigious NAB Crystal Radio Awards. "Ron Chapman has delighted radio listeners with his humor and charisma for more than 50 years," said NAB Executive Vice President of Radio John David. "We look forward to honoring his many contributions to the radio community during the NAB Show Radio Luncheon." Chapman has been heard on the airwaves in the Dallas/Fort Worth area since the 1950s. He began his radio career after high school graduation at WHAV-AM Haverhill, MA in 1953. After broadcasting for the U.S. Army in Korea, Chapman worked at WNHC-AM New Haven, and was shortly thereafter recruited to Dallas' KLIF-AM. Chapman spent six years at KLIF, co-hosting the highly successful "Charlie & Harrigan Show," before joining WFAA-TV in Dallas. In 1968, Chapman joined a team that purchased KVIL-FM, a station known for pioneering the Adult Contemporary (AC) format. He remained at KVIL-FM for 32 years, serving as program director, music director, promotion director and morning personality. In the late 1990's Chapman joined KLUV-FM, an Oldies format that saw high ratings upon his arrival. 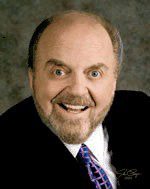 He retired in 2005, but was summoned back to radio a few years later when ABC asked him to become the regular substitute for "Paul Harvey News." Chapman is a multiple inductee to the Texas Radio Hall of Fame.